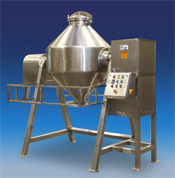 Double Cone Blenders are most often used for the intimate dry blending of free flowing solids. The solids being blended in these units can vary in bulk density and in percentage of the total mixture. Materials being blended are constantly being intermixed as the Double Cone rotates. Normal cycle times are typically in the range of 10 minutes, however they can be less depending on the difficulty of blending. Ross Double Cone Blenders are in stock in 5, 10 and 15 cu.ft. capacity. A full range of sizes from 1/2 to 80 cu. ft working capacity is available. Each is constructed of type 316-stainless steel and is internally polished to a 240 grit sanitary finish. The exterior is polished to an easily cleaned 150-grit finish. All Ross Double Cone Blenders are supplied with Intensifier bars to permit delumping and deagglomeration as needed. Discharge is accomplished through a manually operated Butterfly valve. The valve is positioned 24" from the floor when in the bottom position. All units are provided with appropriate safety railings and appropriately interlocked safety interlocks. Stop-Start and E-Stop Pushbuttons are included with all blenders. Ross Double Cone Blenders are in stock in 5, 10 and 15 cu.ft. capacity. A full range of sizes from 1/2 to 80 cu. ft working capacity is available. Each is constructed of type 316-stainless steel and is internally polished to a 240 grit sanitary finish. The exterior is polished to an easily cleaned 150-grit finish. All Ross Double Cone Blenders are supplied with Intensifier bars to permit delumping and deagglomeration as needed. Discharge is accomplished through a manually operated Butterfly valve. The valve is positioned 24" from the floor when in the bottom position. All units are provided with appropriate safety railings and appropriately interlocked safety interlocks. Stop-Start and E-Stop Pushbuttons are included with all blenders.